The much more prestigious Eclipse Stakes is held on the same day as the Coral Challenge, but this is not to say that the Coral Challenge won’t be receiving its fair share of attention on race day. The field lining up for the race is a very balanced one, and the short distance to be covered is sure to offer up an exciting and tight race. Epsom Dash winner Duke Of Firenze takes the course as favourite for the race, and fighting him for the duration of the 1011 metres will be Kingsgate Native and Sprit Quartz. The best place to have a bet on the 2013 Coral Charge is with Bet365.com. The odds below were taken from the site, and you will be able to find the latest race odds there as well. Bet365.com is also offering each-way betting on the race, with which you will receive 1/4 if should your selection place in positions one to three. Duke Of Firenze showed impressive speed on his way to victory in the Epsom Dash on Derby day. However, he could not repeat his feat at Royal Ascot a few weeks ago. He led the field in the bookies’ markets for the Wokingham Handicap, but ended up finishing a disappointing eighth. The Ryan Moore trained horse will have to step up his game if he wants to build on his Epsom victory, and Moore will be hoping that the Coral Charge is coming at a more favourable time of the season for his charge. Winner of the Temple Stakes at Haydock, Kingsgate Native, is the top rated horse on official figures for the race, and was expected to compete in the King’s Stand Stakes at Royal Ascot but he, too, lagged behind the leaders, ending up at the end of the field. Robert Cowell will also be hoping for a better performance from his horse this time out. Cowell also has Spirit Quartz in the field. 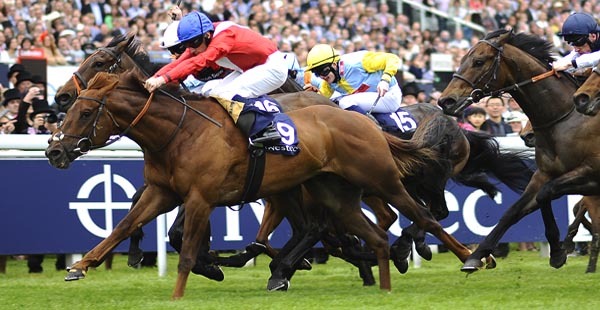 Sprit Quartz, who also finished well down at the Royal meeting, had won his previous race, a Group 2 race in France, and was also placed in some Group 1 races last season, such as the Nunthorpe Stakes in York. Tickled Pink, joint favourite with Duke Of Firenze, started off the season in fine form, winning at Newmarket first up, but has since been well beaten in the her follow-up races. She has never raced at this distance, so the odds seem to be a bit short on this contender. As mentioned above, the best racebook to place a bet on the 2013 Coral Charge is Bet365.com, who will offer the best odds on the race. When visiting Bet365.com, click on ‘Horse Racing’ in the left sidebar and scroll down to the Antepost section of the page, where you will find the markets for this race and many more. The Coral Charge is a Group 3 race held at Sandown Park in Esher, England and is run over a distance of five furlongs and six yards. The race, formerly known as the Sprint Stakes is for horse aged three years old and over, and carries a purse of GBP 60,000. The race is held on the same race day as the Eclipse Stakes, the most prestigious flat race in Britain.